Specifically, the purpose of the Plan is to create an urban neighborhood which leverages the community’s investment in America the Beautiful Park and creates linkages to the downtown core and which is in accordance with the Downtown Action Plan and the Imagine Downtown Plan. 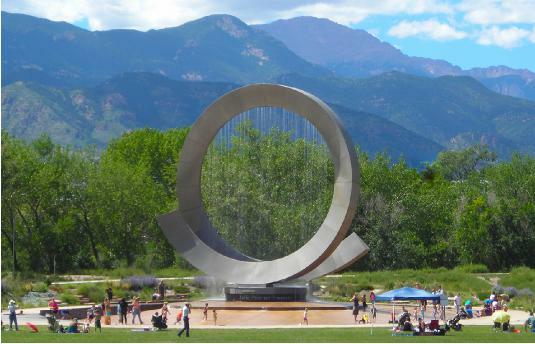 Approved by the Colorado Springs City Council on August 14, 2001. The Southwest Downtown Urban Renewal Area is located southwest of the central business core in downtown Colorado Springs. The area is generally bounded by Interstate 25 on the west and Bijou Street on the north to the Union Pacific railroad lines. The rail lines then form the eastern boundary from Bijou Street to Colorado Avenue. Colorado Avenue then serves as a northern boundary from the rail lines east to Cascade. South of Colorado Avenue, Cascade forms the eastern boundary to Cimarron which serves as the southern boundary of the Urban Renewal Area. Approximately 100 acres are included within the Urban Renewal Area. 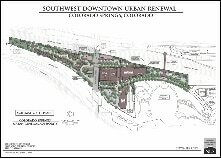 The general purpose of this Urban Renewal Plan is to reduce, eliminate and prevent the spread of qualifying conditions within the Urban Renewal Area and to stimulate the growth and development of the Southwest Downtown Area. In particular, the Urban Renewal Plan is intended to promote local objectives with respect to appropriate land uses, improved traffic, public transportation, public utilities, and other public improvements. Specifically, the purpose of the Plan is to create an urban neighborhood which leverages the community’s investment in America the Beautiful Park and creates linkages to the downtown core and which is in accordance with the Downtown Action Plan and the Imagine Downtown Plan.